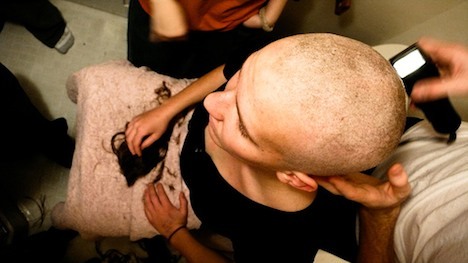 Extreme Minimalism: Would You Shave Your Hair To Be Eco-Conscious? There are all sorts of suggestions for minimalists on getting rid of unnecessary clutter as a way to live greener, more efficient lives. While these ideas often provide very insightful advice and at least get our minds moving in the right direction, what happens when these ideas go from helpful suggestions to downright silly and over-the-top? Well, this list of items takes the cake. It starts out with practical and obvious suggestions such as cable, smartphones, a microwave or a car, but further down it suggests some pretty hilarious items to scrap. The creator of this list is correct. Most of us could scrap the cable television and smart phone and still live productive lives. In fact, it’s probably a smart idea if you want to focus more on your life outside of work and the Internet, and it’s a simple way to cut energy use. The further down this list you go, items like couches and hair join in on the competition. I can understand the couch. If you live in a studio apartment, a futon could double as a couch and a bed. Or, your bed could double as a couch and a bed. Or you can just sit on the dang floor. But hair? I don’t know about that. I might be biased because I treat my hair like I would treat a pet unicorn, but I don’t believe removing a natural growth from your body is among the most practical advice for becoming a minimalist, although maybe it is a question worth asking. Here is an idea that goes along the lines they are trying to reach in regards to losing the hair. Rather than getting rid of your hair for the sake of adding a notch to your carbon footprint, try the no ‘poo challenge (no, not THAT poo). Thousands of women have completely given up shampoo, conditioner and other hair products to not only improve the look and feel of their hair, but to cut down on chemical usage on their body and the amount of it running into the water supply. You can find more information here and give it a shot if you’re looking to get a little greener in your beauty routine. You can get rid of a handful of chemicals and still keep your lovely locks. If you would like to shave your head as a part of greening up your lifestyle, more power to you. However, if you think I’m going to cut off my toes so I can buy smaller shoes for the sake of using less resources to produce them, you’ve gone too far. What do you think of this list? Would you get rid of your hair or try the no ‘poo challenge for the sake of being a little greener? I would if it meant something more than a symbolic, minimal effect. Wigs are awesome. However, you’re right. There are non-toxic shampoos out there. And really, know what makes a bigger difference than cutting off your hair? Take shorter showers. Better yet, take shorter showers, and turn the water OFF when you lather up your hair AND run that loofah all over your glistening bod. Saving water is almost, if not more important than those shampoos. Because using too much water involves heat from coal plants, or using precious natural gas (or petroleum), importation of water (if you live in dry climes), and depleting water supplies in an ever warming world climate. Seriously. I probably wouldn’t shave my head, but I would definitely consider using less and different shampoos/conditioners for my hair. Don’t wash your hair more than once a month (you can go 3 to 6 months easily). Even in heat that makes you sweat profusely, you only really need a quick rinse to get rid of dirt. If you wash your hair too much, your body stops producing oils that it naturally produces to the degree that it regularly produces them. These oils keep your hair healthy and looking just fine. If you’ve never tried it before, you’ll feel disgusting for about a week, then you’ll be amazed at how well your hair is doing. I many cases, people’s hair becomes healthier once they stop using shampoos that are designed to help nurture and care for their hair’s health.